In our new Fall podcast, we meet James and his baby brother Jack again. You may remember them from another podcast where James is so excited when he learns he is going to be a big brother, then so disappointed when baby Jack can’t do anything. In the story today Jack does lots of things. I sing a song called “Things I can Do” and you get to do all those things with me. The song uses a different letter for each verse. For example the first verse has things I can do beginning with P. I sing “I can pedal,” “I can paint,” “I can paddle,” and “I can play.” I also include the letters S, T and D. I’m sure you can think of lots of ideas for the song. Anneliese sings the second song called “Walking, Walking, Walking,” which has lots of actions you can join in with. And of course the song lends itself to allowing you to come up with some different actions. If you have listened to several podcasts, you will know I often have action songs included. A new action, in both songs, is keeping still. This is quite hard for young children to do, but gets better with practice (just keep singing the songs!) as children learn to control their bodies. This is definitely an action-packed podcast. Enjoy! This podcast is as new as can be. The last song was recorded only last week and the podcast had its final editing on Thursday! 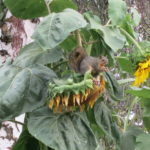 Very timely for Fall, our podcast features sunflowers and a squirrel. The picture shown here was the starting point for the whole podcast. 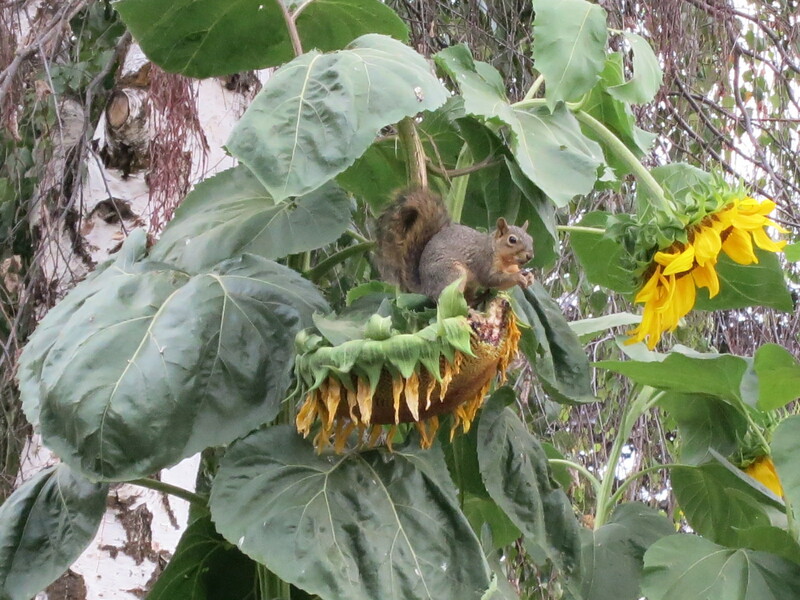 Taken right from our garden we were able to watch the squirrel on the sunflower head, munching on the seeds. This launched the story of squirrel watching the sunflower grow, waiting for the delicious seeds. As you probably can guess, it is not quite as easy as Squirrel expects. The first song has the little grey squirrel going up, up, up the maple tree, then down, down, down the maple tree. You may notice how the music moves up the scale with the squirrel and down the scale as he ascends and descends the tree. This is one of those songs I love to sing with children as it allows us to get creative and think of different trees for the squirrel to go up and down. The second song is a very gentle song about flowers and is incredibly easy to sing along with. We begin with a sunflower, then sing snapdragon, primrose, wild orchid and end with an opportunity for the listener to add a couple of flowers of their own choice. That’s strong, and sticky and neat. I hope you sing this part along with Bethany. Now not all spiders make webs, but many do, and that’s what Webster, the spider in our story does. I did some research about spiders and building webs and used the information I learned for the lyrics in the song. Our story features a spider called Webster that unknowingly becomes a “pet” for William. I have written several stories that involve a group of children who are at school together. Sometimes the story is about the whole class and their teachers, Miss Emily and Miss Hannah, and sometimes about one of the children in the class. William is in this class. Perhaps you recognize the names James, Flora, Katie, Tom and Zoe from other stories? Don’t forget to visit the Crispy Crow page on the LISTEN TOGETHER PODCAST website where you can find activities for everyone to enjoy even if you are not a subscriber yet. Apples are a delicious fruit, come in all kinds of colors and have wonderful names. Most of us buy apples at the grocery store, but in the fall, if you are lucky, you might have a farm nearby where you can go and pick your own apples – straight off the tree. Zoe and Tom go to Yew Tree Farm to pick apples with their parents in our story this week, and have lots of fun bobbing for apples and even go on a hay ride. This podcast is called APPLES, and our first song is about apples. It is a song I composed and I hope you will sing along with me. The second song called “Goin’ on a Hay Ride” was composed by my friend Linda and is sung by Bethany. LISTEN TOGETHER PODCAST subscribers have access to four podcasts every month. Some are of a seasonal nature, such as this one called APPLES. In winter time I have some podcasts about snow and ice skating. In spring we have songs and stories about everything growing in the garden and even a podcast in April about Earth Day. If you are not a subscriber yet, I hope you will listen to RABBITS. This podcast is available for everyone to listen to, and can be found on both the samples page and the home page of the web site.